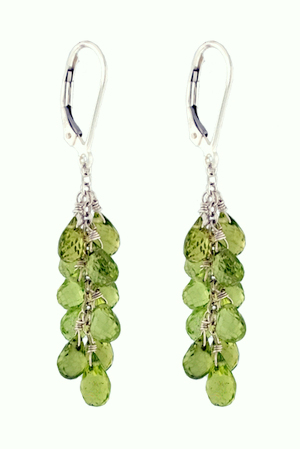 These are very popular earrings, Peridot briolettes on sterling silver leverback earrings. Also available with garnet, pink topaz, blue topaz and other gemstones/colors. Amazing and fun 11 peridot briolettes sparkle and move on these wonderful earrings. Sterling silver lever-backs keep them securely in your ears.